There are few things in life you invest more time and money in than your home. So naturally, when it comes to taking care of it, you want to do whatever is necessary to ensure that your home retains its value. That’s precisely the concept behind Gutter Helmet® – the original gutter protection system. Gutter Helmet® prevents debris from getting in gutters, eliminating the hassles, damage and dangers caused by clogged gutters. Clogged gutters overflow, causing rot in walls and fascia board, soaking basements, ceilings and crawl spaces. Gutter Helmet® keeps your gutter cleared of leaves and debris in all types of weather for truly comprehensive protection from water damage. No more gutter cleaning means less roof traffic, so Gutter Helmet® protects your roof and shingles too. It also helps protect the landscape under your gutters from overflow damage, and the foundation from cracking. 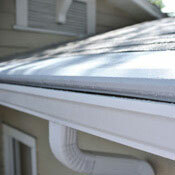 In winter, it helps protect your fascia and gutters from freeze thaw expansion. Because there will be no standing water in your gutters, insects will be less likely to breed. Attempts by homeowners to solve clogged gutter problems with screens have failed. Screens just don’t work. Screens can be as much work as gutter cleaning – seedpods can still accumulate in them and squirrels and other animals can pry them loose. The solution is Gutter Helmet®. We Guarantee You’ll Never Clean Your Gutters Again! Every time you climb a ladder to clean your gutters you’re risking injury. In fact, falls are the #1 cause of injury, according to the US Department of Safety. Stop putting yourself in danger. With our gutter protection system, you can hang up your ladder for good, because you’ll Never Clean Your Gutters Again®! The secret is surface tension. 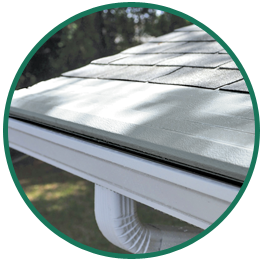 The property that makes water cling when it spills down the side of a glass is the secret behind Gutter Helmet®. Water clings to Gutter Helmet® and flows nicely into your gutters while debris falls away. A unique water adherent coating further enhances the patented surface tension design. In fact, it can handle rainfall of over 22 inches per hour – twice as hard as it has ever rained in the U.S., according to the National Weather Service. 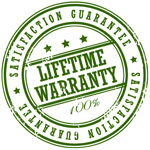 Our customer’s have found time and time again that Gutter Helmet® pays for itself by saving you money on gutter related cleaning and repairs. It also saves the headache and liability associated with hiring non-professionals to climb on your home to clean gutters. They are made of heavy gauge aluminum, and come in a variety of colors to blend nicely with your roofline. Gutter Helmet® development dates back more than 40 years when MIT alumnus, Bob DeMartini began engineering work on an improved, meshless cover for roof gutters. From his inventive mind, the professionally installed gutter protection industry was launched. That is why Gutter Helmet® can rightfully claim to be the first. (Fact – Bob was an engineer at General Electric in Schenectady, NY!) Many copycat products have come and gone over the years, but they just grow stronger, experiencing double-digit growth every year. Why? Because it works! Gutter Helmet® is committed to ongoing product development and improvement. Seven granted and pending patents prove it. They’re backed by Hart & Cooley a 100+ year-old U.S. manufacturing leader. They provide value and benefits that no other competitor can offer. Gutter Helmet® Professional Dealers have installed more professional retrofit gutter protection systems than all our major competitors combined. With over 100 million feet installed and over 200,000 customers, you can be sure you are installing confidence.